Ludwig van BEETHOVEN: Symphony No. 8 in F Major, Op. 93 (1812). György LIGETI: Concerto for Violin and Orchestra (1993). Thomas ADÈS: “Powder her face” Suite (1995/2017). Igor STRAVINSKY: Divertimento: Suite from “The Fairy’s Kiss” (1928). 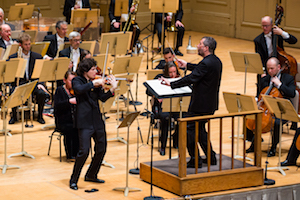 Augustin Hadelich (vln), Boston Symphony Orchestra, Thomas Adès (cond.). Symphony Hall, Boston. January 25, 2018, 8pm. At the end of the week of January 22nd, Boston audiences were treated to composer / conductor Thomas Adès leading the BSO in a program that touched all the bases: a symphony, a concerto, an opera paraphrase, and a ballet score. It was a long evening. A sedate Beethoven’s Eighth began the concert. Ideas and melodies were arranged with precision, but the inherent spirit and cleverness were obscured as if providing the music was a tiresome chore. There was more liveliness when Augustin Hadelich took to the stage in a commanding performance of Ligeti’s Violin Concerto. Perhaps, like late Beethoven, Ligeti in his later years enjoyed rummaging through his bag of tricks: We heard shout outs to minimalism, African rhythms and Spectralism across five immensely interesting movements. The score calls for a chamber ensemble heavy on percussion, with one violin and one viola tuned off the standard. Several of the wind players double on ocarinas. Ligeti found amazing chords and colors with the small ensemble, the quarter-tones notwithstanding. Hadelich provided the local premiere of Adès’ cadenza for the Concerto: With its unrelenting rapid-fire virtuosity, it stood out as an obsessive addition. For an encore Hadelich provided Paganini’s 21st Caprice which, with its clear-cut tonal fireworks, was evidently more to the audience’s liking. After intermission, Adès led an orchestral Suite from his 1995 chamber opera Powder Her Face, written when he was 24, and scored for four soloists and a 15-person ensemble. In this immense arrangement, everyone busies throughout a fractured sequence of dance tunes writ large and loud. The original version strove to be larger than life, but exaggerated here, it comes across bloated and self-important. Compared to the more efficient Ligeti, Adès was like a haranguing drunkard veering from one crowded ballroom to another. Particularly famous details of the opera’s plot were omitted from the BSO’s notes. The evening ended with an understandably less-familiar Stravinsky orchestral score, the Divertimento from the ballet The Fairy’s Kiss. It pays homage to Tchaikovsky, and if folks were expecting something akin to the artfulness of Pulcinella, they would have been disappointed. Inventive programming, but audience and orchestra had clearly tired by evening’s end. Charles IVES: Sonata for Violin and Piano, No. 4, “Children’s Day at the Camp Meeting” (1914-16); Sonata for Violin and Piano, No. 3 (1914-16); Sonata for Violin and Piano, No. 2 (1914-16); Sonata for Violin and Piano, No. 1 (1914-16). Var. comps. : Var. Hymns. Stefan Jackiw (vln), Jeremy Denk (pno), Hudson Shad (vocal ensemble). 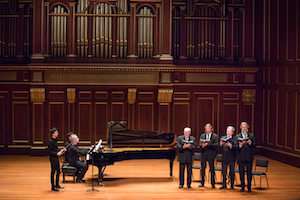 New England Conservatory’s Jordan Hall, Boston, presented by the Celebrity Series of Boston. January 26, 2018, 8pm. On Friday, January 26, violinist Stefan Jackiw and pianist Jeremy Denk were joined by a quartet of male voices from the group Hudson Shad. The menu offered all four of Ives’ violin sonatas with illustrative hymns. That the audience persisted for the entire evening is a testament to the fine performances and the right balance of educational commentary and personal anecdotes which Denk dispensed animatedly throughout the evening. How rare it is to have an all-Ives evening! Ives made bold use of American hymns, some of which have since been forgotten, and Hudson Shad sang just enough to help us see what Ives was doing with / to them. There is no standard way to play these century-old sonatas. The notation is clear enough so that they can be played precisely. Or they can be considered in the context of the German Romanticism under which Ives was schooled. Or the borrowed material can be dramatized. The last represents Denk and Jackiw’s approach, a goulash where Brahms, or ragtime, or secular hymn could mix freely and be highlighted with knowing glances and effusive rubato. It is just fine that there is no standard approach to these pieces. The sonatas were played in reverse numbered order, which put the shortest one at the start, and the longer, perhaps most difficult to comprehend works towards the end. For those who might have found Ives’ shuffling of Romanticism and Americana arch and disorienting, Denk and Jackiw’s emphatic playing made clear that something complicated was going on, but that we could trust it would all be okay at the end. J.S. BACH: Concerto in D Minor for Three Pianos, BWV 1063 (ca. 1730). Sean SHEPHERD: “Express Abstractionism” (2017). Felix MENDELSSOHN: Symphony No. 3 in A Minor, Op. 56, “Scottish” (1842). Kirill Gerstein, Jean-Yves Thibaudet, Thomas Adès (pno), Boston Symphony Orchestra, Andris Nelsons (cond.). Symphony Hall, Boston. February 9, 2018, 8pm. 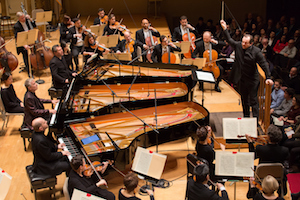 In the BSO concert series of February 8 to 10, Adès joined Kirill Gerstein and Jean-Yves Thibaudet on stage, this time as one of three pianists. Andris Nelsons led an efficient presentation of Bach’s Concerto in D Minor for Three Pianos, which was strange to hear on modern instruments on the big Symphony Hall stage. Gerstein played from a tablet, Thibaudet and Adès used music; Thibaudet sported a fancier jacket, slightly overshadowing the matte black attire of the others. 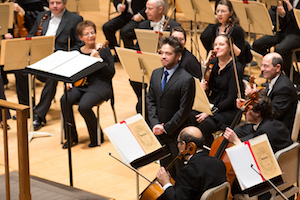 This concert was part of a series, “Leipzig Week in Boston,” to acknowledge Nelsons’ concurrent appointments as music director of the BSO and the Gewandhausorchester Leipzig. The concert I saw on Friday, February 9, was abbreviated, dropping two Schumann choral settings (Nachtlied, Op. 108, and Neujahrslied, Op. 144). The evening’s centerpiece, or at least the item warranting a majority share of attention, was a new work for orchestra by the young American composer, Sean Shepherd (b. 1979). Embodying a profusion of interesting moments, “Express Abstractionism” is either too short for its abundance of material or too long for its lack of development. (How often have I commented thusly on new music?) The composition’s title and movement names hint at a connection with artists of the 20th century, but as is my habit at first hearings, I avoided the notes so that the music could speak for itself. Shepherd’s palette recalls the refinement of Boulez and Dutilleux, language that the BSO speaks readily. Interesting ideas would be layered, repeated; the orchestra as a mass would move from loud to soft, or simple to complex, with not unexpected logic. Overall, the work is consistently well-balanced in timbre and timing, which satisfies when the entirety clocks in at around a quarter of an hour. I would hear the piece again, but wonder if it is too short for what Shepherd is trying to say. The conclusion of the last movement veers close to Copland’s prairie sound, which surprised given the more fecund dissonance that had come before. The notes reference five artists: Wassily Kandinsky, Piet Mondrian, Lee Krasner, Alexander Calder and Gerhard Richter. The work may have been harder for audiences to appreciate if Shepherd had labelled the work a symphony (although it didn’t sound like the four movements correspond to the traditional structure). Regardless, there were extended bouts of coughing throughout the house. Relating the music to visual art softens the blow of the new and unfamiliar; it definitely provided a starting point for the program annotator and the composer. I know something of these artists and their output: Shepherd wants to connect their way of working with his own, and I can’t buy it. Keep the details a mystery and present your music as an abstraction. Oh. Yeah. That’s the title. The concert closed with a fine delivery of Mendelssohn’s Third. After Shepherd’s energy, the Scottish was calming. Afterwards, I realized I had anticipated the Italian symphony, which might have actually made better company. (Keeping to the concert’s theme, the Third was premiered in Leipzig, whereas the Fourth was first heard in London.) Thinking back to Beethoven’s Eighth, it’s evident that Nelsons works magic with the BSO.